NADIR Ciftci insists he is up to the task of being Celtic’s number seven. The Turkish hitman has been handed a four-year contract after sealing his move from Dundee United. The Hoops have paid an undisclosed fee, reported to be around £1.5million, for his services and Ronny Deila will now look to the 23-year-old to fire the goals that take his team to the Champions League group stages. Ciftci will wear the number seven jersey made famous by club icons Jimmy Johnstone and Henrik Larsson but insists he will not let the burden of that honour weigh him down. The big frontman said: “It’s a favourite number for myself too - I’ve been wearing it everywhere else I’ve been. Celtic was always my first choice. The former Terrors striker could make his Hoops debut in Friday night’s pre-season friendly with Real Sociedad in Paisley. His competitive bow is then likely to come next Wednesday as Deila’s team kick-off their attempt to reach the Champions League group stages when they take on Icelandic minnows Stjarnan in their opening qualifier. But he may have to wait for his domestic introduction after he was charged with biting Dundee’s Jim McAlister in United’s final game of last season. He faces a Hampden hearing on July 20 but was prevented from discussing the accusations by the club’s media officer as he was paraded at their Lennoxtown training base. Ciftci, who collected 11 bookings and one red card last season, sees no problems on the horizon with skipper Scott Brown. He escaped an earlier ban last term despite appearing to plant his knee into the Scotland midfielder’s face during a fiery Tannadice clash back in March. Brown claimed after the match that Ciftci had “blatantly” kicked him in the head - but Ciftci believes the two can now work together. He said: “We are professionals and on the pitch you do your job for the team you play for. Ciftci was offered the chance to link up with former Celtic defender Gary Caldwell at Wigan but rejected the move as he insisted on making his Parkhead switch. 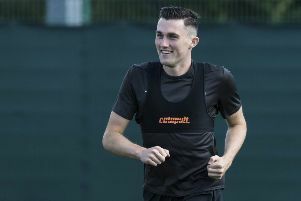 He was made to sweat, though, as United chairman Stephen Thompson knocked back two Hoops bids before finally giving him the green light to sign for the Glasgow giants on Tuesday. The former NAC Breda forward said: “Celtic was always my first choice. “Everybody knows how big a club it is. I knew it before I even came to Scotland. I’ve played two years against them now but you really see it once you sign for them. “Hopefully I can bring a lot to the team. I’m fit to play, so it’s up to the manager if I play or not. “I had two great seasons at United and I’m really thankful for that. Everyone at the club - the staff, the fans, my team-mates - they made we really welcome. “It’s obviously really tough to leave a club like that after two beautiful seasons but I’m looking forward to a new chapter. “I respected what Dundee United were looking for from the offers but it wasn’t something I was really thinking about at the time. Ciftci will have to dislodge Leigh Griffiths if he wants to claim a starting spot at Parkhead, but after hitting 33 goals in 82 games for the Arabs, he is ready to take the next step. He said: “Hopefully we can get into the Champions League - that’s the biggest stage and where Celtic belong. I want a taste of that.